JCU is committed to enhancing student access, participation and success through a whole-of-institution approach to widening participation, learning, teaching and the student experience, including appropriate facilities and access to technologies. 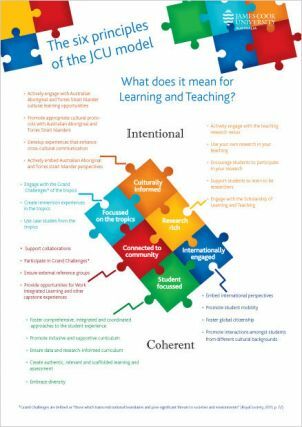 Our Learning Design priorities support the 2018-2022 JCU Academic Plan, which says: "Our programs will enable students to be adaptable and acquire the digital literacy, intercultural communication, collaboration, career management, innovation and entrepreneurial skills required to succeed within complex career landscapes of the future." Strengthening the coordination of opportunities for students to participate in student placements and authentic projects (WIL). 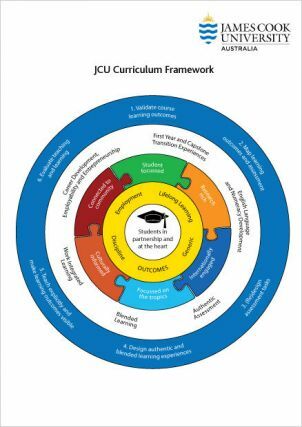 The JCU Curriculum Framework contextualises the work of curriculum design, enhancement and innovation within the current higher education legislative and JCU strategic and policy contexts. Purposefully designed curriculum resources support the Student Digital Experience (SDE) at JCU, and these resources create an engaging journey that develops digital literacy and leads to student success. Our Learning Design process is informed and driven by student needs and support for desired learning activities and learning outcomes. LearnJCU (log-in) s JCU’s online teaching and learning environment, built on the Blackboard Learning Management System. Career development is a key component to supporting graduate success. Modern theoretical frameworks for careers and employment centre on the production of ‘career ready’ graduates, rather than simply ‘job ready’ graduates. This involves the systematic, strategic embedding of career development, employability and entrepreneurship throughout learning experiences. The team in LTSE offers academic staff support to embed careers and employability tools and resources into undergraduate and postgraduate courses and subjects. Student placements, projects and fieldwork give our students authentic and valuable practical experience, and help develop essential transferable skills for the future. LTSE has developed a suite of work-integrated learning (WIL) resources for staff, and a comprehensive student placements and projects website for students and industry hosts/supervisors.